The Master of Business Administration, MBA (International Business) Programme at the School of Business and Law, University of East London, UK is aimed at providing a stimulating and supportive learning environment in which your management education may develop. UEL believes that the development needs of managers vary at different stages of their careers and consequently UEL offers a wide range of programmes to meet these needs. The MBA programme makes a significant contribution to this portfolio. 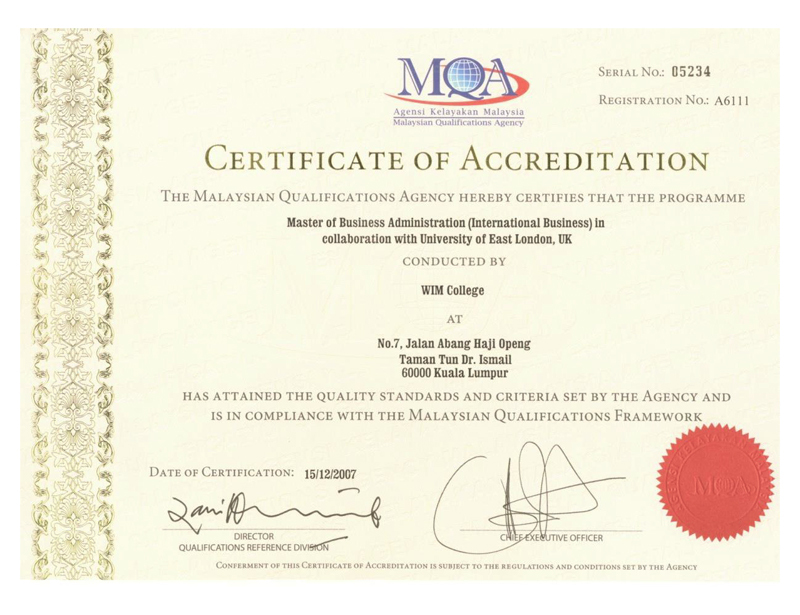 The MBA benefits from the perspective and experience given through the successful operation of MBA programmes both in the UK and overseas, especially in Malaysia, Singapore, Europe and China.Successful completion of the programme MBA (Internationa lBusiness) at WIM College leads to the award of Master of Business Administration by the University of East London. The MBA is aimed at practising managers or those looking to develop their knowledge and skills within an international business management. Students will explore the management and development of people within organisations, gain an understanding of the use, range and limitation of research methods, and gain an awareness of how to develop business policies and strategies that meet the needs of stakeholders. The programme also seeks to develop students’ knowledge of the finance of business, looking at how this is managed and reported and evaluate the impact of external forces on productivity. Our MBA is a recognised qualification of managerial competence at a strategic level and as such exemptions are granted by numerous professional organisations. It also opens the way for continuing personal and professional development. Many of our graduates have gained significant promotion upon completion of the programme. Graduates from this programme can use the letters MBA after their names. Each module will be delivered in one semester and will be one semester in duration. Students will be expected to have successfully completed all other modules before attempting the Postgraduate Dissertation. Teaching and learning methods used are varied. They are designed to encourage students to accept responsibility for their own learning, collectively as a group and individually. The programme hopes to promote independent study and the development of self-management skills. There is a requirement for students to undertake set reading on certain topics and explore relevant literature for assignments and seminar discussions. Students are expected to demonstrate knowledge and skills gained through participation in seminar discussion and oral presentation. The programme aims to have a high degree of participation, encouraging sharing of information, ideas, experience and values. Students are expected to use their knowledge and expertise to relate theory to practice in the context of their own work experiences and allow them to apply the theory they have learned to real life examples. The programme aims to develop an approach to learning which encourage you to “transform” rather than simply to “reproduce” the theories and ideas to which you are introduced. Overall the intention is to enable you to develop as someone who is proficient in the acquisition of relevant knowledge and skills in the various fields of management and someone who is committed to a critical understanding of your own learning and potential professionalism. The learning environment will not be limited to the traditional methods and will incorporate other learning tools such as guest speakers and study tours. Guest speakers will share their personal experiences with students, which will allow them to learn about a variety of industries from a managerial perspective. Study tours will help students to get a first-hand experience of how other organisations operates and sustain their business. A high standard of written English and presentation. Logical and well-structured argument and organisation. Critical understanding of theory and concepts. Application of this understanding to business practice. MBA Intakes enrolment are done every 2 months. Kindly call us to check on the starting date of the new intake. Thank you. Classes are held at least two (2) weekends in a month [Saturday – half day afternoon and Sunday – daytime] at WIM’s owned 6-storey building in Taman Tun Dr. Ismail, Kuala Lumpur. Classes are held at least two (2) weekends in a month [Saturday – half day afternoon and Sunday – daytime] at WIM’s owned 6-storey building in Taman Tun Dr. Ismail, Kuala Lumpur. Classes are held fortnightly on weekends and allowing one weekend in between for students to spend time with family and to catch up on research and assignments. There are no weekday night classes. Lecturers are stringently selected and approved by UEL. WIM students will have direct access to UEL online library which has more than 18,500 books with access to six business-related online databases containing over 1,000 full text journals. The main aims of this session are to equip students to become effective learners at postgraduate level, and to ensure that students have sufficient capability in relevant learning and study skills. write academic assignments in appropriate language. use an appropriate layout and style for various types of assignments. edit their own writing for grammatical accuracy used in academic. practice writing and receive feedback on their writing style, accuracy and clarity. reference other authors’ work in a variety of ways to avoid plagiarism. This session is to enable students to develop relevant knowledge, skills and experience for the formulation of successful proposals for the management research. Meetings between the students and their respective supervisors will be scheduled periodically to ensure that students are equipped with the relevant skills to understand how to carry out appropriate research in business contexts and be able to critically evaluate the research of others. Wisma WIM is a carefully planned homely environment that is equipped with classrooms (with WiFi access), WIM physical library, computer lab, student’s lounge for relaxation, break-time and group discussions, pantry with refrigerator, microwave oven, hot beverage and snacks are available, hostel accommodation with special rental rate for outstation students and ample parking bays. To network with like-minded individuals who have a common goal to improve their career advancement, personal and professional skills. Gain the edge over your peers via knowledge sharing and know more about any industry of interest. Build network with leaders of corporations by social events and seminars. Gain insight into future trends in industries. What is it aimed to do? Monthly talks by industry leaders and experts. Social gatherings with corporate organized events. Organize leadership, soft skills, economic and industry based talks and seminars. Link members to alternative ways to penetrate into other industries for career progression. Organize summits for all members and aspiring members, thus spreading the network of CNM across Malaysia. Arrange study tours to different organizations in various industries. Affordable fees – EPF (Account 2) withdrawal and flexible instalment plans are available. Fees are inclusive of lectures, lecture notes, examination, WIM library facilities and UEL online library access. The MBA is a recognised qualification of managerial competence at a strategic level and as such exemptions are granted by numerous professional organisations. It also creates a pathway for continued personal and professional development. Many graduates of this programme have gained significant promotion and successful career development. Furthermore, the MBA has given students the confidence and knowledge to be able to start their own businesses or to help improve the running of their own businesses.